Archaeological Sites Worth Visiting in Costa Rica… Really? I mean, Costa Rica is about nature, and wildlife, and rainforest and all that, but there are no pyramids or such… Yes! But, still! There are some magnificent places, surrounded by extreme nature that can whisper stories of times long gone, but still here, living in the remaining rocks. Costa Rica is famous for a lot of things; volcanoes, beaches, national parks teeming with life, zip lining, rafting, etc. Still, a lot of treasures in the country are often overlooked. Among the attractions, there are some unique archeological sites. And although they are no rivel for places live Teotihuacan, Copan, or Machu Picchu, but still, there are at least two attractions worth the time and visit. Both of these sites are now accessible and ready to receive the amazement of travelers. Guayabo has long been known as a national monument by the Costa Rican Government. It’s located east of San José, north of the city of Turrialba. There are tours, which take you into the National Monument and specialized guides that can explain the last detail of the place. On the way in, you will find that the last few miles, before arriving to the monument, can be a bit bumpy, but completely accessible for any vehicle. The monument has been designated a World Heritage Civil Engineering site. Lately, there has been a deep dig going on, with the purpose of learning about the ancient construction techniques. The goal is to allow for reconstruction and preservation in the most authentic manner conceivable. Recent dating with Carbon 14 indicates Guayabo was built between 900 and 1100 A.D. Which means that it is more than 900 hundred years old. There is an easy 1-mile trail, called Sendero Los Montículos, that takes you through the forest, past mounds, walkways, aqueducts, stone stairs, water storage tanks, and rectangular stone tombs. The engineering, especially around the management of water resources, is remarkable. Don’t miss the petroglyph (low relief carving in stone) in a small covered display area near the visitors’ center. And lately with the Turrialba Volcano erupting since 2014the combination can be magical. You cannot climb to the volcano, but if you are lucky you can witness some of its magnificent eruptions from anywhere in the nearby valley or mountains. Archaeological Zone Ranch 6 is an unpolished name for a delightful site in Palmar Sur, the far south of Costa Rica. It is also known sometimes as the Parque Arqueológico, Las Esferas de Diquís, etc. If you mention “Las esferas,” the spheres, any local will understand what you are talking about. The site is located just a few miles south of Palmar Norte on the Inter-American Highway. The road is easily reached in any vehicle. There are a newly opened visitors’ center and a transportation area to facilitate parking, buses, etc. 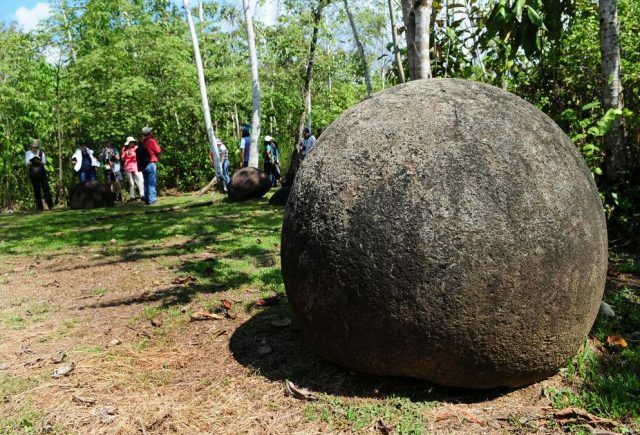 The spheres are pre-Columbian man-made stone balls. They range in size from 4 to 60 inches in diameter and up to 16 tons in weight. They are extraordinarily round and uniform. For a great number of years, this quality led many to question whether they were the result of some natural phenomenon. The four primary locations of the spheres were named by UNESCO as World Heritage sites in June of 2014. The Park has well-marked trails with explanatory signs. The trails wind around past working plantain fields and through brush. There are some spheres and some mounds, and they are all in cleared grassy areas. You may find interesting also: Is the Turrialba Volcano Region the new Arenal? The spheres attract significant attention for their mystery. One Spanish astrologist tried to organize an international rock concert at the site. There was a lot of publicity and some talk of New Age mysticism, but they ended up wallowing in very earthy Costa Rican mud. Dating the spheres is mostly a guessing game. There are starting dates as early as 300 B.C. and as late as 500 A.D. They were made for an extended period but were no longer being fabricated by 1500. A trip to Finca 6 can easily be combined with travel to other stimulating destinations. It is not far from the main road leading to Puerto Jiménez, the jumping off point for the wilder areas of the Osa Penninsula. Just a couple miles south, you will find the lovely, and little known, town of Sierpe. Sierpe is one spot for pontoon boat tours of the mangrove swamps. Larger vessels take visitors to Isla del Caño, Corcovado, etc. It is also the point of embarkation for boat shuttles to Drake Bay. There are a number of good hotels and great restaurants in Palmar Norte and Sierpe.